Grand spot to watch the sun set over Stirling. They've been as rare as hen's teeth through July these have. The clouds and rain have kept them hidden most nights, but managed a worthwhile trip to the top of Fallin Bing for an hour or two's photographic endeavour. 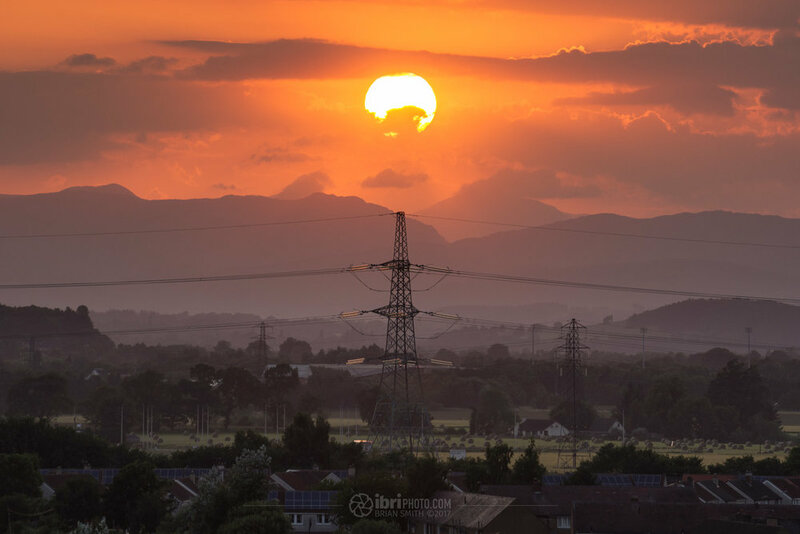 Sun setting beyond Stirling and the mountains of the Trossachs beyond. Perched on top of the, now nature reclaimed, colliery bing near one of the old eastern mining villages in the Stirling area. The pylons along the Denny - Beauly line; enhancing or hindering the shot depending on your point of view. It was only when I was tagging and looking back through the archives I realised I'd been here almost exactly a year before doing the same. Like someone sweeping a torch over Callander.